Pink sand verbena is an annual (sometimes perennial) species of maritime beach habitats, including disturbed sandy areas, coastal scrub, and lees of sand dunes (Spellenberg 2004). It is endemic to the central Pacific Coast of North America where it is found within the driftwood zone. Only one population of the species is known in Canada, from Pacific Rim National Park in British Columbia. Although plants have not been seen in several years, recovery efforts are underway to reintroduce it within its historical range (Fairbarns et al. 2007). This is a prostrate, mat-forming species with a deep tap-root and trailing stems (Hickman 1993; Spellenberg 2004). Flowering occurs year-round. Fairbarns (2010) provides the following detail in Botanical Electronic News (BEN) (#428) about this species: "Abronia umbellata subsp. breviflora occurs south along the beaches and dunes of British Columbia, Washington, Oregon and California as far as the Point Reyes area, near San Francisco. It is ranked globally imperilled (NatureServe 2009). Southwards from San Francisco it is replaced by A. umbellata Lam. subsp. umbellata. 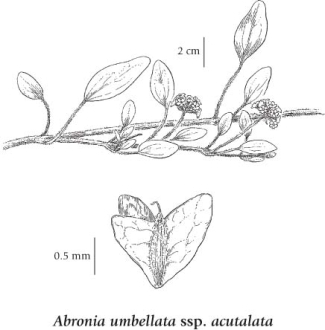 Tillett (1967) assigned populations in Canada and Washington to A. umbellata subsp. acutalata (Standl.) Tillett, however, examinations of morphology and chloroplast DNA failed to show any difference between subsp. acutalata and subsp. breviflora (Karoly ex Kaye 2002) so northern plants are now assigned to subsp. breviflora In Canada. Abronia umbellata subsp. breviflora is ranked as endangered and protected under the Species-at-Risk Act (Douglas 2000, 2004; Fairbarns 2010)." Read the full BEN article. There is a 1915 collection record for this species by C. F. Newcombe (Clayoquot Sound) in the UBC Herbarium. Annual, sometimes perennial herb from a thick, deep taproot, densely glandular-hairy throughout; stems trailing, to 1.5 m long; branches short, forming mats. Opposite, thick and fleshy, lanceolate to narrowly egg-shaped, 2-6 cm long, 0.8-3.5 cm wide; stalks 2.5-7 cm long. Inflorescence of many-flowered, rounded heads on stout flower stalks 2-4 cm long, involucral bracts 5 (4), in a whorl, narrowly lanceolate, 5-6 mm long; perianth tube greenish to pinkish, 6-8 mm long, widely flaring into a pink, 5-lobed limb 5-6 mm wide. Achenes, 10-12 mm long, prominently 3- or 4-winged, the wings of the fruits wider than the fruit bodies. 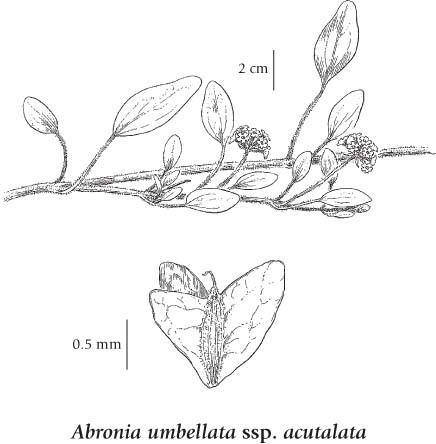 This regional endemic was considered extinct in BC and WA until recently (Douglas et al. 1998a, Washington Natural Heritage Program 1994). Two plants of this species were rediscovered in 2000 and subsequently destroyed by a winter storm that year (Douglas 2001). In May 2001 three plants reappeared at the same site. Coastal sandy beaches below the driftwood zone in the lowland zone; rare on the W coast of Vancouver Island, known only from Ahousat and Pachena Bay (in 1915 and 1927, respectively) and more recently from Clo-oose Beach, Pacific Rim National Park; S to WA. Vegetatively, Abronia umbellata var. breviflora could be confused with Abronia latifolia (yellow sand-verbena). Abronia latifolia has yellow flowers, broader ovate to reniform leaves, and achenes with wings narrower than the body of the achene. It has habitat requirements similar to those of A. umbellata var. breviflora; the two species can grow intermixed. Abronia latifolia is also known from the outer beaches of Vancouver Island. Abronia umbellata var. acutalata (Standl.) C.L. Hitchc. Spellenberg, Richard W. 2004. Abronia umbellata var. breviflora. Flora North America Online.